A more form-fitting corset cover being needed for an ensemble nearly completed, I decided to construct a fitted sleeveless corset cover from the January 1909 issue of The American Modiste. 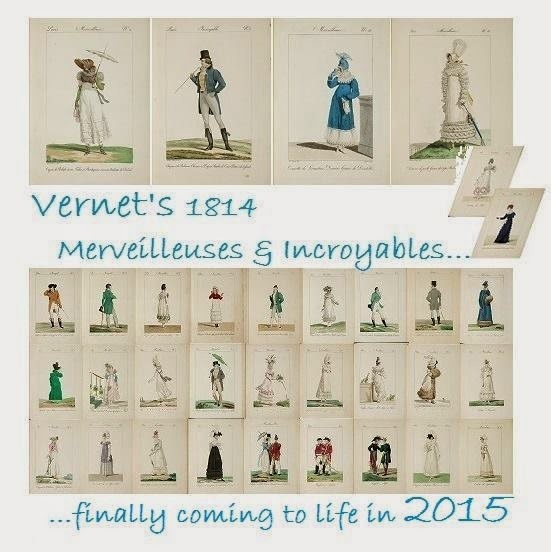 The pattern is reprinted in full in Frances Grimble's The Edwardian Modiste. So far, the project has gone amazingly well, excepting one silly mistake on my part. 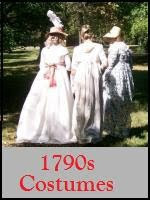 This Part 1 of the dress diary covers drafting and cutting the pattern. 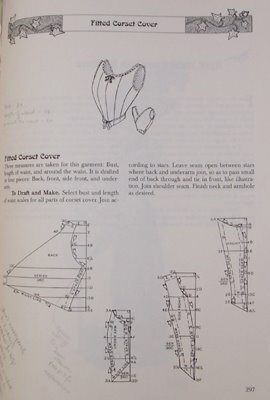 Left: The corset cover diagram and its pattern pieces. The cover fits snugly in front, and has no front closing. Instead, the two back pieces end in long ties; the back pieces cross over one another and the ties come around front and are tied. This means that the cover can be eased or fitted as needed. I liked that simplicity. 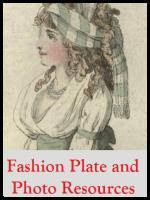 The American Modiste patterns were designed to be used with a set of special proportionally scaled rulers. They are marked in proprietary units made of numbers and letters. Frances Grimble's book supplies you with printed copies of the scales in the back of the book. You pick the particular rulers that fit your measurements, and then use them to draft copies of the pattern up to your size. Since Frances didn't have access to the curved ruler, she suggests using a French curve to make up the curved parts of the pattern. Drafting the pattern proved to be much, much, much easier than I thought. Certainly easier than trying to size up the pattern on the computer and then printing out and matching bits of paper to one another. I don't have a big projector and so couldn't project the pieces up on a wall. This pattern required a bust measurement ruler, called a "scale", and a "length of waist" (neckbone to waist) measurement scale. Mine are 36" and 18". 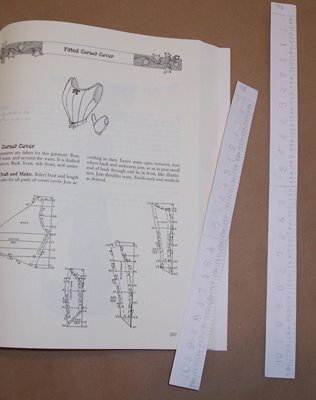 Left: The corset cover diagram and the two scaled rulers. Therefore, I needed the 36" scale ruler for the bust. According to instructions, I doubled the length of waist measurement and came out with 36" again for that scale. 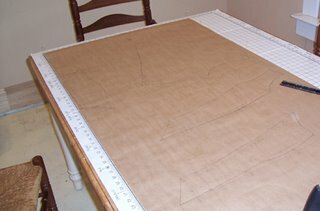 I traced the 36" scale onto a sheet of paper. I pasted that to a piece of cardboard, and then cut it out carefully, and taped to a housepaint stirrer. Voila: scale ruler! 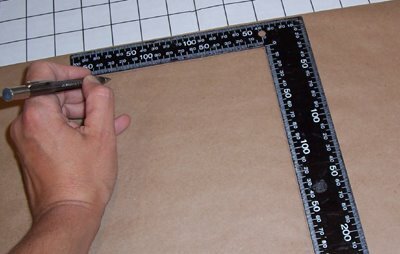 You need a big sheet of nice, stiff Kraft paper, a pencil and eraser, a French curve, that special scale ruler, and an L-square marked in inches. Each pattern piece is marked onto a sort of grid, with a "baseline" across the top, the 0 point at top right, and a vertical axis running straight downwards from 0. The result looks like a backwards, upside-down L. Each pattern piece is laid so that the straight of grain runs straight up and down. At key points in the pattern piece, such as a left edge or the top of a curve, horizontal lines are measured out from the vertical axis. For example, if you're looking at the pattern piece for the back, there is a horizontal line drawn at 11 units+D sub-units down from 0. It is drawn out to the left 15 units+C sub-units. It marks the extreme left edge of the pattern piece at the waistline. 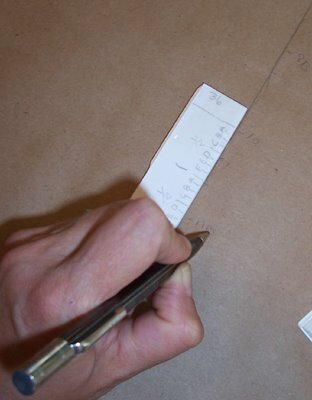 Above: Drafting horizontal crossline points on the Kraft pattern paper with the special ruler. draw the baseline and vertical axis with the L square. Then you use the scale ruler, and working from the copy of the pattern piece in Frances' book, measure where each of the horizontal grid lines meets the vertical axis. Then you use the scale again and draw out each horizontal grid line to the length marked on the book's copy of the pattern piece. Then you connect each end of each horizontal line like you would dots, following the outline of the pattern piece in the book. 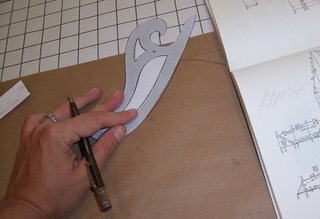 You use a French curve to help you with curved sections. Above: drafting a curved section of the pattern. Not having my own French curve, I copied one on paper and cut it out. The pattern pieces have a certain amount of ease built in, but not much. Some hems are built in and some aren't, and some seam allowances are marked, and some aren't. Frances Grimbles' directions tell you to add extra for seam allowances and ease, and so I did...ended up having plenty and to spare, and was able after fitting the cut pieces, to re-mark the pattern pieces with adjustments so next time I have a good fit for me right off the bat. Left: The pattern pieces drafted.